"Like me, Lenny was a major horror movie fan from childhood… We'd both seen how the audiences had loved it when I was with The Cordials and we'd sing 'Little Darlin' and I did the monologue in the middle of the song in Boris Karloff's voice. We agreed that the Karloff voice was the most obvious one to tell the story. And what was the story? And a hit was born. Bobby "Boris" Pickett passed away last Wednesday, April 25, 2007 at age 69. "Monster Mash" wasn't Pickett's only song to make it to the charts; he had two others, "Monsters Holiday" and "Graduation Day," but it was the graveyard smash that would define his life. Not only did "Monster Mash" make it to the top of the Billboard charts in 19 and 62 , but the song also re-took the charts in August of 19 and 70 and May of 19 and 73, joining "White Christmas" and "The Twist" as one of only three songs to ever reach the charts three separate times. A Somerville, Massachusetts native, Pickett was a high school basketball star in the ’50s who wanted to become a Hollywood actor. "His dad worked at a movie theater," said deejay Paula Street, who knew and liked Pickett, "and that’s where he picked up the Boris Karloff impression he does in the song." As a high school basketball player, Pickett would sometimes relieve pre-game pressure by doing impersonations of Karloff for teammates. After a stint in the army, Pickett moved to Hollywood in the early `60s, never really making it as an actor, but still appearing in several TV shows, such as "The Beverly Hillbillies" and "Petticoat Junction" as well as several Z-grade movies including "Lobster Man From Mars," which also featured Tony Curtis. 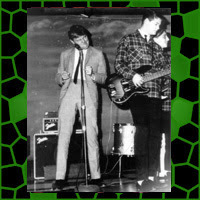 Pickett was also part of a transplanted Somerville vocal group called The Cordials, which had followed him to L.A.
"I was doing stand-up comedy as an impressionist, doing characters including Peter Lorre and Boris Karloff," Pickett said in a 1992 interview. "The Cordials would do [the Diamonds' hit] 'Little Darlin', and as a joke, I started doing the recitation in Karloff's voice." 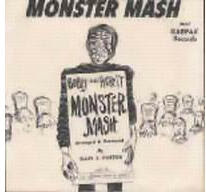 Inspired by the then red-hot "Mashed Potato" dance craze, Pickett and Somerville buddy Leonard Capizzi wrote "Monster Mash" in a half-hour one Saturday afternoon. Pickett was also the one behind the song's sound effects. The creaky door at the beginning was a nail pulled from a piece of wood and the boiling cauldron was Pickett blowing bubbles in a cup of water with a straw. The recording session was supervised by producer Gary Paxton, who'd already had one novelty hit in 19 and 57, with the Hollywood Argyles' "Alley Oop." Paxton came up with the idea of calling Pickett "Boris" and the backing band, "The Crypt-Kickers." The Crypt-Kickers included members of Ronny and the Daytonas, the Ventures, the Bermudas, and Leon Russell, yes, the Leon Russell, on piano. A top studio session player of the `60s, Russell's piano would also be featured on Herb Alpert's mega-hit album of 19 and 65, "Whipped Cream & Other Delights," as part of the then non-existent except in the studio "Tijuana Brass." Done in one take, "Monster Mash" was rejected by every major label it was pitched to. But not discouraged, Paxton pressed one thousand copies of the record and drove up and down the coast, hawking the song to every radio station on the way. The strategy paid off, shooting "Monster Mash" to Number #1 on the charts in just eight weeks. "Monster Mash" has sold over four million copies and has been included on countless compilations, soundtracks and television shows. It's been covered by the Beach Boys, the Bonzo Dog Band, Sha Na Na, and by "Monster Mash" fan Boris Karloff himself on the TV show Shindig! in October of 19 and 65. "Maybe I haven't made millions but I have been paying the rent for years with this one song," Pickett once said. "When I hear it, I hear a cash register ringing." And somewhere in a special spot of heaven reserved for beloved monsters like Frankenstein and the Wolfman, the ghoulies and ghosties are doing the Transylvania Twist. Sources: The Monster Mash site; "Hub crooner lovingly created a 'Monster.'" - The Boston Herald; 14 Reasons Why Bobby "Boris" Pickett Was Cool; Obituary from The Independent; Monster Mash trivia and information; Wikipedia.